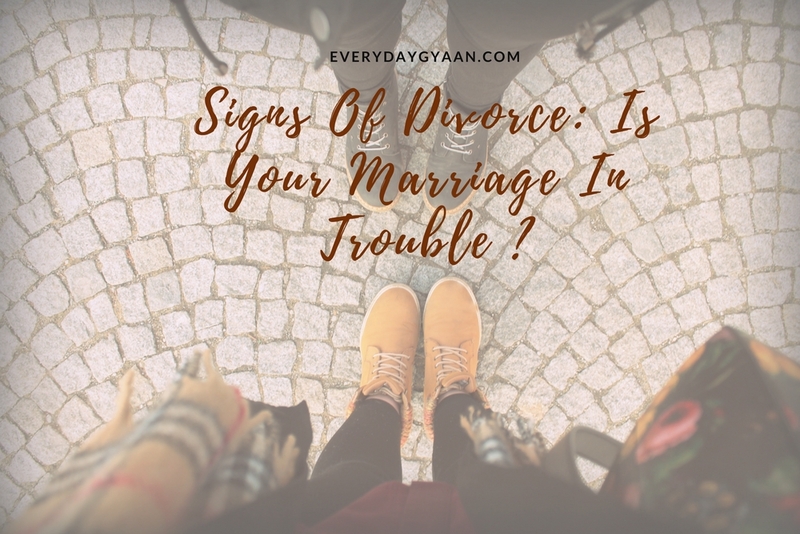 Everyday Gyaan Signs Of Divorce: Is Your Marriage In Trouble? You are here: Home / Love and Relationships / Signs Of Divorce: Is Your Marriage In Trouble? When walking down the aisle, no one stops to think about the worst-case scenario. All marriages begin with the hope of a future full of trust, contentment, and bliss. However, the reality in today’s society is that divorce is increasingly becoming a common phenomenon. It is vital to learn how to identify the signs that your marriage could be in trouble. It is normal for fights to arise in any marriage. However, unresolved arguments have the potential to become an impediment to happiness. When the underlying problems causing the fights are left unaddressed, partners begin to consider divorce. The lack of motivation to reach amicable agreements is also a predisposing factor to divorce. Subsequently, unresolved issues and the lack of motivation to solve them leads to resentment; which is a predisposing factor to divorce. Frequently, many married couples slip into a habit of complacency and fail to consider each other’s needs. Complacency occurs when one or both partners continually fail to listen to one another’s concerns. Consequently, the partners begin to experience less affection and to undermine intimacy. Eventually, the next best option is to confide in parties outside of the marriage. Couples often divorce due to a sense of unfulfilled emotional needs. It is imperative that partners regularly listen to one another, and also learn how to empathize. It is common for many people to blame money issues, or a lack of intimacy as the principal causes of divorce. While such matters have the potential to exacerbate the desire to get a divorce, the common triggers of divorce are rarely reviewed. Poor communication is a considerable cause of divorce. When married couples fail to communicate, they begin to feel disconnected and distant. Money problems and lack of intimacy are consequences of poor communication. Couples should inculcate the ability to discuss any issue without feeling rejected, criticized, or ignored. Family lawyers Parramatta cite prolonged abuse as a major precursor to divorce. Victims of abuse in marriages often wait for the aggrieving party to change. However, such partners never change unless there is professional intervention. Physically abusing a partner in the confines of marriage can evoke feelings of mistrust, intimidation, and fear. When one or both partners, no longer find value in the other, they engage in multiple, illicit affairs outside marriage. It is demoralizing when one person has to forgive the other, more than once, because of cheating. If one partner consistently breaks promises to stop cheating, the marriage will most likely end in divorce. Affairs also cause irreparable damage to trust and security in marriage. Money is an emotive issue in marriage. Therefore, it is essential that both partners are always on the same page when it comes to finances. Divorce often occurs when one partner begins to spend money selfishly, without considering the family’s well-being. Couples should strive to spend money wisely to avoid putting the entire family in jeopardy. Big weddings seem to be the norm. But I’d rather couples spend more time getting to know each other before marriage than spend time planning the big bash. After marriage, they should learn to reach out for help at the first signs of trouble. Communicating effectively is something I’ve had to work on. The benefits have been enormous. Great advice here. Oh yes, I’ve seen that in my own marriage, Ness. Corinne, you pointed out at signs that has the risks of a marriage being on the rocks. As I look around me, many of my friends are facing the same issues that are leading their marriages to end into divorce, infidelity, lack of communications or straying partners. Glad this made sense to you, Vishal. It’s always sad when marriages break up, even if it’s often for the good of both parties involved.